The Mercury reported on a man from the UK being told that his custom TC Mobility wheelchair was banned from the roads. Why? 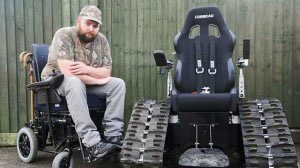 Because, according to the specs, the all-terrain chair is considered too wide which lands it in the same category as a tank. The $24,000 wheelchair weighs 485 pounds and uses two rubber treads and a 24-volt electric motor which allows the owner, Jim Starr, to go over any terrain such as snow or on the beach with his family. Now that he has the ability to go anywhere, the catch is that to go places, he has to cross public roads to get there. And that’s illegal according to authorities. Here’s a video of his “tank wheelchair” in action. Jim doesn’t want to use his chair for traveling on the road, just to cross the road to reach the beach. Meanwhile, an equally, bizarrely huge wheelchair sets new world records. Haidar Talib Erabeh invented a solar-powered wheelchair that is being touted as the world’s first (really this one was the first) and managed to set another world record with it. Haidar, who caught polio at the age of 4, built the solar-powered wheelchair himself before taking it on a 200-mile long journey. As long as the sun is shining, the futuristic chair should never need to stop to be charged. At the World Future Energy Summit in Abu Dhabi, some people “mistook the wing-like panels for a metal umbrella to be used for protection against the sun. As it turned out, the panel was to draw sunshine and power the machine as it was a solar wheelchair,” reported UAE Interact. His eco-friendly wheelchair is equipped with four batteries that can keep the chair moving for six hours even under cloudy skies. According to Alternative Energy News, Haidar will be mentioned twice in the Guinness Book of World Records for “traveling 80 miles during a 14-hour trip from Abu Dhabi to Sharjah at a speed of 12 mph on a solar-powered wheelchair” and for “making his own record better by 200 miles” in the same wheelchair. Both of these wheelchairs are cool. Although I don’t know if it would be categorized as a tank, I doubt if Haidar would be allowed to drive his solar-powered wheelchair in the UK. The solar panels look to be at about 4 feet wide. This is an amazing content.I like this one.The written skill is so good.There are no obstructions because you can do as you think.Thanks to share tis blog with us.Keep sharing.I will keep share in future.